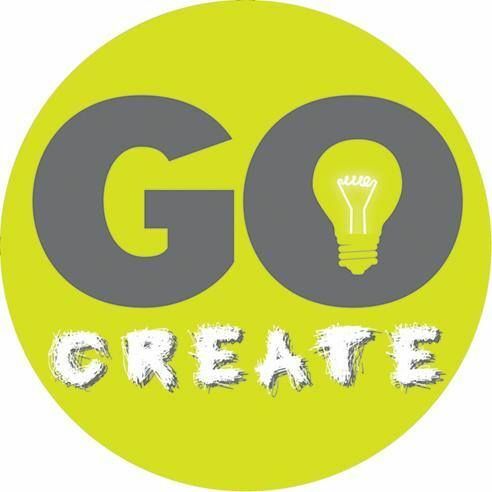 Ever since The Quilling Guild endorsed Pixie-Hood Looping as a recognised technique seen in antique quilling, I’ve been fascinated by its creative potential … and when Janetta van Roekel demonstrated her ‘curly flowers’ variation at the Guild’s recent Shared Ideas Day, I was definitely ‘hooked’!! 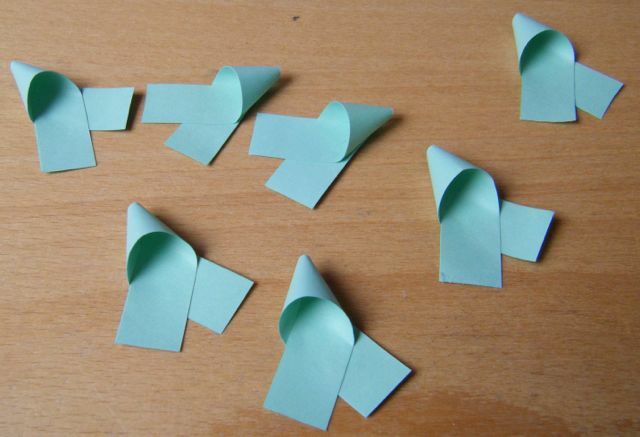 Make seven pixie-hoods from 7 x 8cm lengths of 15mm paper. 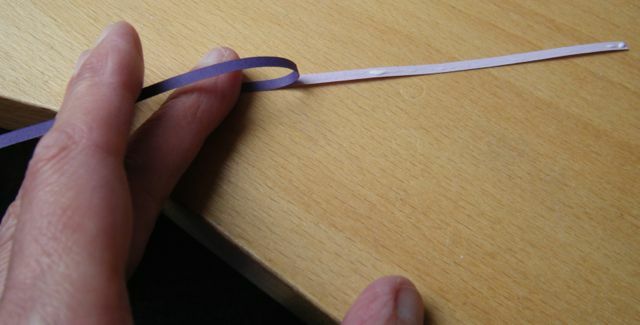 Take 7 x 12cm lengths of 3mm paper in lilac, and glue a 12cm length of 3mm deep purple paper to each, gluing along its whole length. Allow to dry. 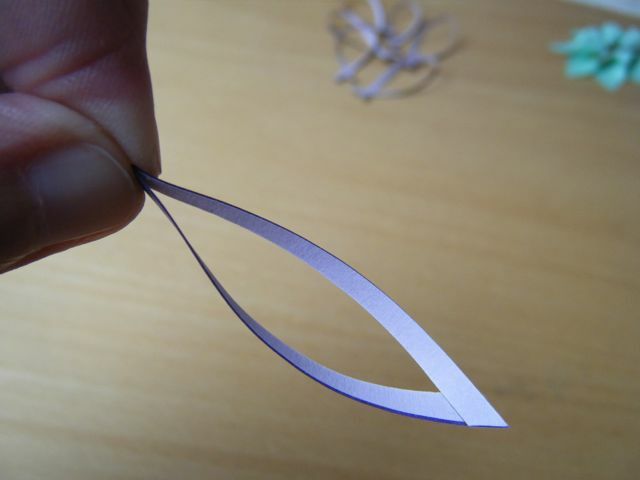 Make the resulting two-tone lilac/purple strips into loosely open pixie-hoods, with the deep purple side on top. 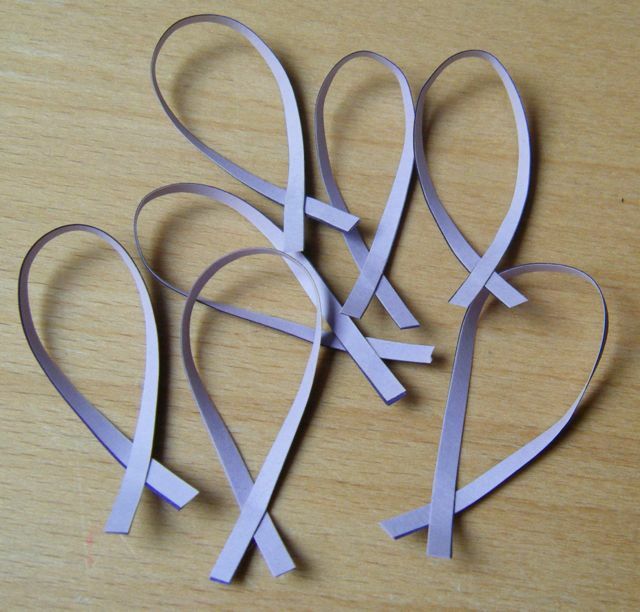 Trim the cut ends of each of the two-tone pixie-hoods (referred to from now on as the ‘cross-over end’) and pinch the opposite loop into a point, now holding the pixie-hood with the lilac side uppermost. 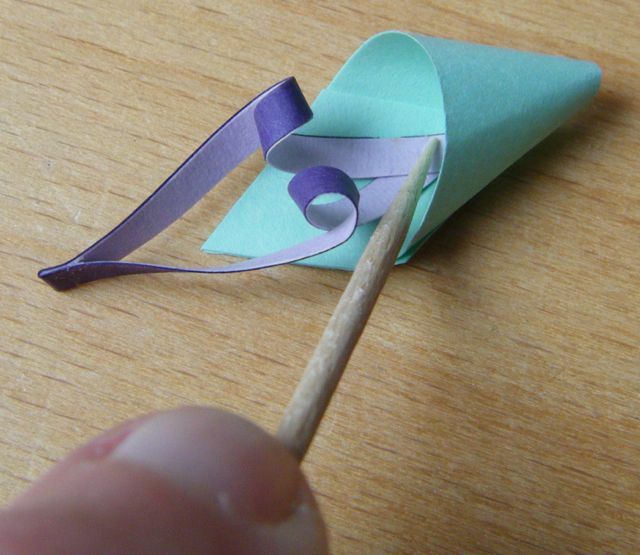 Secure the pinched point with a dot of glue. Allow to dry. 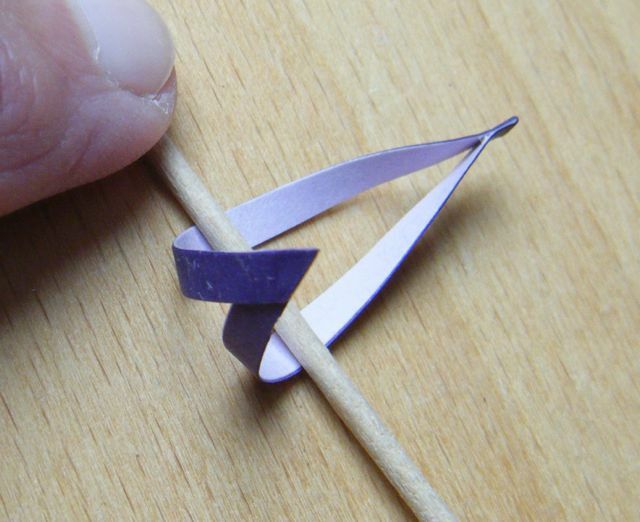 Place a cocktail stick across the inside (lilac side) of each two-tone pixie-hood, thread the ‘cross-over end’ through and under the ‘pinched point end’ and pull tight, bending both ends up towards you before removing the stick. Then, holding both ends, pull again gently to tighten the curls. 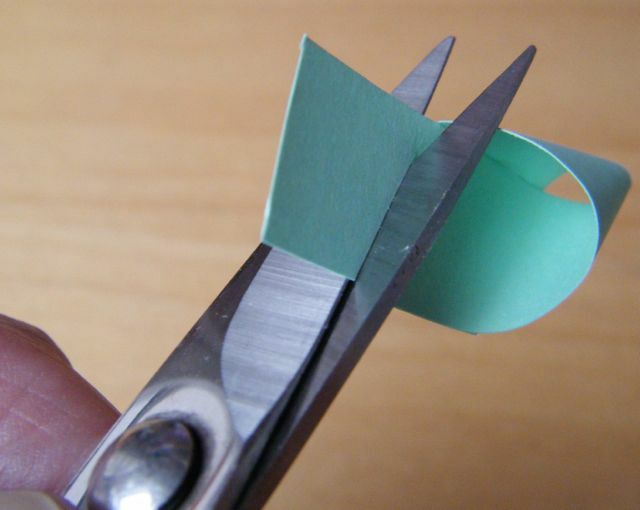 Insert the ‘cross-over end’ of each curled pixie-hood into a green pixie-hood sheath as shown, securing with a dot of glue. Press down for a few seconds with a cocktail stick until firmly attached. 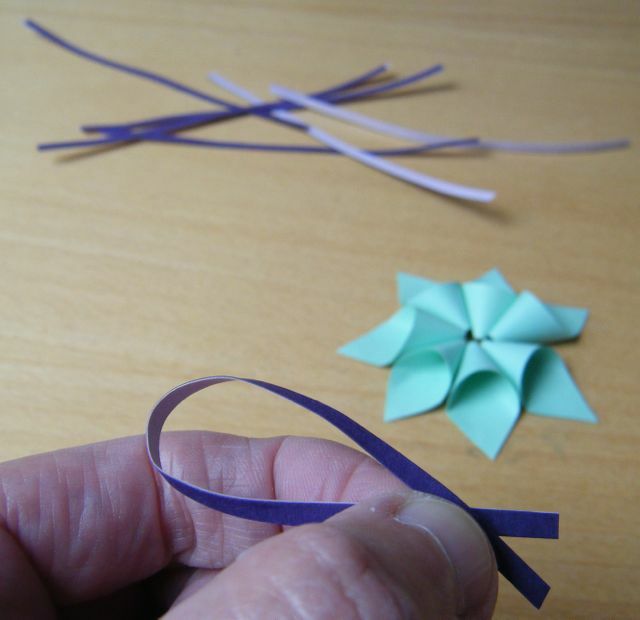 Assemble on to the card as shown in the first photo, and glue a small fringed pom-pom in the centre. 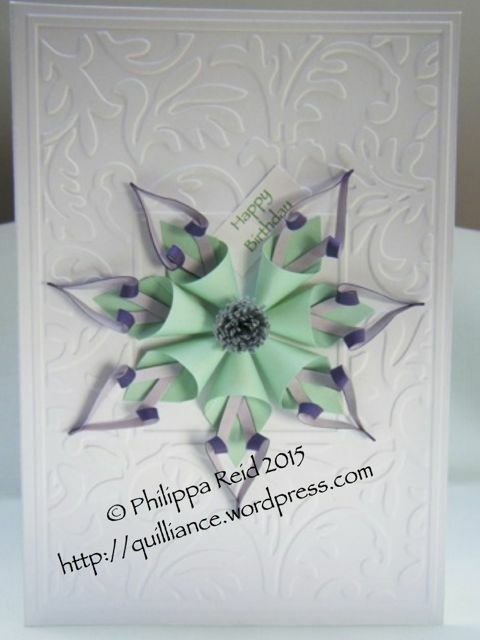 I also added a little printed ‘Happy Birthday’ greeting tucked in behind the petals, inspired by a special personalised touch in the lovely birthday card that I received recently from my talented friend Jill Chapman of Paper Daisy Card Design. Very very interesting, i will try. Thanks a lot. Very cool design with those pixie hoods Philippa! 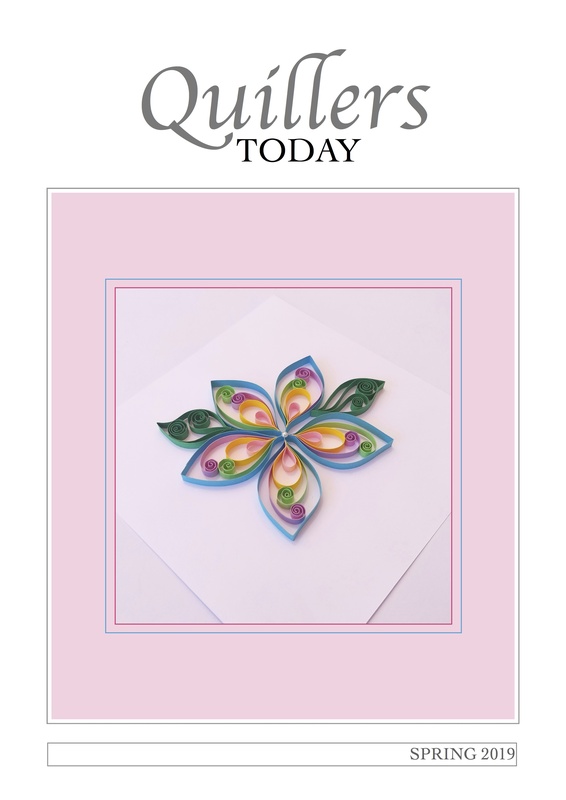 I can imagine making quilled snowflakes with them too!